This entry was posted in Uncategorized and tagged headlines, journalism, journalists, newspapers by Joanna. Bookmark the permalink. Great question. Some might regard it as dangerous, but it is undoubtedly another of the difficult ones the industry will have to face sooner or later. I’m not about to suggest do away with subs because experience tells me that you need several pairs of eyes checking stories before they get published. A good sub can also turn a pig’s ear of a story into a silk purse (although I’ve known some to do the opposite). I used to “suggest” my own headlines and standfirsts on features as it seemed an obvious thing to do and I’d check space and position on page beforehand. But I also wanted it subbed by others. Subs still have an important role to play and I would be happy to argue that they should be looking at blogs linked to their own title/organisation too. What’s the point in having a style and standards in the paper and the online version, if you then get basic mistakes on the blogs. Some might argue that blogging is different, but the credibility of the media organisation doesn’t change. But I guess I’m still too old school in my ways. It is the point I said above – that the journalist would write a completely inside-the-story headline which might not mean much to the average reader. Could subs report? Backbenches do all the time, pulling together wire stuff on breaking news. Though these days they’d do well to use Twitter etc too. The scope of subbing is changing, just as that of reporting is. But headlines? It’s a war zone. 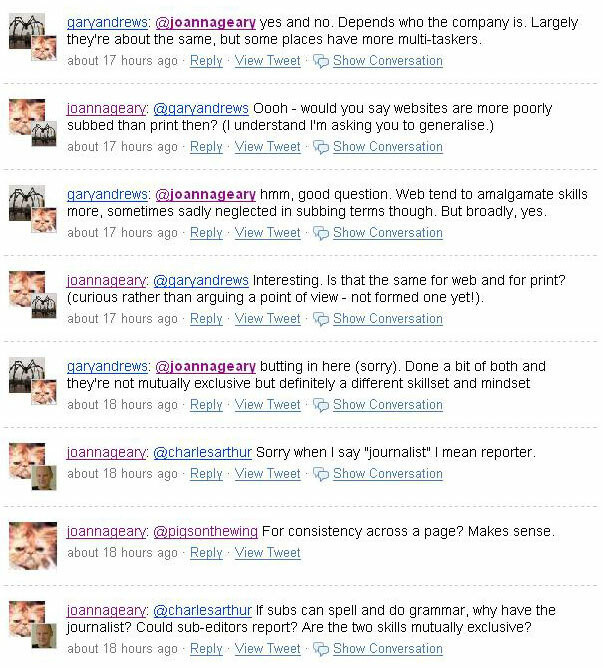 Hi Joanna, I’m a print and web sub who’s been replying to your tweets on this but think I’m caught in the whirlpool of following / not being followed. From experience, I’d say the client sites I’ve worked on are less subbed because time has not been booked into the production process to allow for even a basic check. Result: unclean copy, dulls lead-ins, unchecked facts, potential legal issues, etc etc… Why is subbing suddenly seeming unimportant when the need for it still exists – esp with recent online libel wins? Plus, outside publishing, people are usually unaware of subs and sub-editing. One comms office I now sent their mag home with a receptionist to proofread on the bus. Sigh. Re headlines, it’s not just down to page layout, getting a balance of headlines, or fitting the house style or SEO needs, etc. Sometimes subs find the point buried half way down a story, a slight rewrite ensues and where the body goes then so must the head follow. I also agree (having done both) that writing and subbing are totally different skill and mindsets. No reason why a reporter, or a sub, can’t be flexible and do both – but the fact is some writers don’t want to know the ins and outs of semi-colon usage while some subs would freak at the thought of interviewing a Burger Boy. Now how do I get onto your tweet radar, lady! though you did reply to it at the time. There’s a lot more to a decent headline than decent spelling, punctuation and grammar. A headline has to be great, or at least good, or very few people will read the story. Plenty of reporters, even the great ones, are not great writers. Writing and reporting are not the same thing. 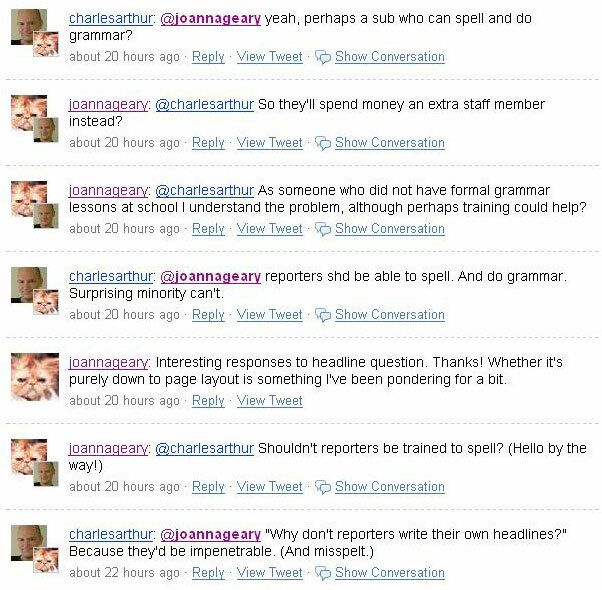 It’s a “dangerous question” because reporters writing their own headlines would mean fewer subs being employed, but as Paul Groves says, that doesn’t mean it won’t get asked and, one day, answered! It’s the headline that’s important not who writes it.